3.8 Detailed Taxonomy of Misconceptions, Preconceptions, etc. Emphasize motivation. This includes encouraging curiosity and the love of learning for its own sake. It also includes explaining the practical value of what is being learned. Emphasize learning as opposed to mere teaching. It doesn’t directly matter what you teach; it matters what the students learn. Emphasize personal responsibility. Learning is the students’ responsibility; you cannot do it for them. Your job is to inspire them and help them to fulfill their responsibilities. Responsibility can be taught, bit by bit, over the long haul. The topic of responsibility should be addressed directly. It should be discussed early and often. There should be clear rewards for responsible behavior. I tell students that more than 90% of what they need to know, they need to learn on their own. All I can do is help get them started in the right direction. To say the same thing the other way, you cannot explain idea X in terms of idea A unless the students already understand idea A.
Accentuate the positive, and emphasize constructive suggestions. In particular, start by teaching the correct ideas, as opposed to starting by confronting misconceptions. For details on this, see section 3. Students can’t learn everything at once, but they have to start somewhere. That is: If the long-term goal is for the students to have a comprehensive, detailed, sophisticated, rigorous understanding of the subject, they can’t learn that on the first day. Typically the students start by learning some examples, analogies, and approximations. This should include explicit disclaimers emphasizing that the examples are not entirely representative and the approximations are not exactly accurate. Next the students should learn some math and some theoretical principles, which they can apply to the examples. Also they should always make every effort to see the connections between the new information and everything else they know. Then they should spiral back and learn a wider range of examples, better approximations, more math, more theory, and more connections. And so forth, iteratively. Explicitly teach students how to learn, and how to remember what they have learned. There are a number of standard techniques to help with memory, some of which date back 2500 years. Memory should not be thought of as a substitute for critical thinking, or vice versa. Indeed, memory itself is a thought process. Being able to recall relevant information is a necessary ingredient for critical thinking. Each of the associates is a hook to which it hangs, a means to fish it up when sunk below the surface. Together they form a network of attachments by which it is woven into the entire tissue of our thought. The ‘secret of a good memory’ is thus the secret of forming diverse and multiple associations with every fact we care to retain. Thinking about the connections between a newly-learned idea and older ideas is first of all a check on the correctness and consistency of the ideas, and secondly serves to reinforce the memory of both the new and old ideas. To say the same thing another way: A rote memory can be recalled in one way, so technically it counts as a memory, but it is not a very useful memory. In contrast, a well-constructed memory can be recalled in 100 different ways, which makes it 100 times more useful. There is a fine line between an approximation and a misconception. In teaching, as in every other facet of life, approximations are necessary. On the other hand, any approximation can be abused. Not all approximations are created equal. There are good approximations, mediocre approximations, and bad approximations. It takes skill and judgment to know the difference between a good approximation and a bad approximation in any given situation. Whenever possible, it is desirable to have a controlled approximation. For example, it is of some limited value to say π is approximately 3.1, but it is incomparably more valuable to say that π is greater than 3.1 and less than 3.2. The latter is a controlled approximation, which means you know how accurate is. You know the limits of validity of the approximation. Preservice and novice teachers beware: the space of misconceptions is larger than you can possibly imagine. Just because you were never confused about this-or-that doesn’t mean your students won’t be confused about it. That’s one of the many reasons why you give tests: to find out what you didn’t cover sufficiently well. Don’t become part of the problem. The usual advice is, don’t teach misconceptions, and don’t teach nonsense. That advice is harder to follow than it might seem, because we are constantly besieged by misconceptions and nonsense. This includes the misconceptions we grew up with. The misconceptions and nonsense are particularly pernicious when they appear in textbooks and in state-mandated “standards” and tests. Almost any topic can be taught in N different ways, most of which will cause trouble later, and only a few of which form a good foundation for further work. Just because it was badly taught to you doesn’t dictate that it must be badly taught by you. If a student seems confused or hesitant, don’t be shy about asking the student what the problem is. Sometimes they don’t know what the problem is ... but sometimes they do. Learn from other teachers. Whenever possible, drop in on other teachers, to see how they handle things. Learn from your students. I have a long list of nifty ideas I learned from my students. It is sometimes claimed that in the long run, the cheaters harm only themselves, but it is not true. Sometimes jobs, scholarships, and even the privilege of staying in school are awarded partly on the basis of grades, and unfair grades can cause serious harm to innocent students and third parties. In particular, you must not tolerate any situation where students who are not predisposed to cheat feel obliged to cheat just to keep up. I don’t want to live in a culture where cheating is considered normal. School should not train people to think that cheating is normal. Do not tolerate plagiarism, since it is a form of cheating. More generally, do not tolerate anything that gives an unfair advantage to some students over others. For example, you should assume that some students will have access to the questions and answers to tests given in previous years, filed away in fraternities, private homes, et cetera. I mention this because even if such files are not against the rules, they are unfair, because not all students have equal access to the files. Making a rule against such files is not helpful, because it is more-or-less unenforceable. Therefore: do not re-use previous years’ questions, unless you have made sure that all students have equal access to the questions and answers. Constructive suggestion: If you want to re-use any questions from previous years, you can level the playing field by making previous years’ questions and answers available, on the web or otherwise. By way of example, consider the tests given by the Federal Aviation Administration. For each test, there is a pool of approximately 1000 possible questions, of which a few dozen appear on any given instance of the test. The questions are a matter of public record, but the large size of the pool discourages rote memorization, since most people find it easier to to learn the underlying principles than to memorize specific answers to specific questions. If you want to re-use a question from a previous year, another way to encourage understanding (as opposed to mere rote regurgitation) is to rejigger the question so that even though the idea is the same, the answer is not literally the same. Don’t teach as you were taught. I was explicitly told that by a mentor, back when I was getting into the teaching business. For one thing, obviously, if everybody were to teach as they were taught, there would never be any progress. Meanwhile, there is a less-obvious and far more interesting reason: Don’t teach as you were taught. Students will make mistakes you never dreamed of making yourself, and you have to be prepared for that. Don’t even teach the way you wish you were taught. The students are coming from a different place, and they will need things you didn’t ever need yourself. Give them what they need, not what you would have needed. This applies to pretty much everything, not just lectures. Ironically, sometimes students learn a tremendous amount from a situation where the teacher makes a mistake, catches the mistake, and deals with the consequences. That’s important ... and very tricky to do properly. As usual, all the extremes are wrong. Yes, it is possible for the teacher to be too slick, too over-prepared ... but it is of course possible, easier, and far more common to be under-prepared, which not good either. Again, this applies to pretty much everything, not just lectures. It is also super-dependent on where the audience is coming from. The level of slickness that is appropriate for an invited talk at the annual American Physical Society meeting is wildly different from what’s appropriate in September in the introductory physics course. The introductory students “should” have been exposed to this advice every year for the last 10 years ... but they probably haven’t. What’s worse, they probably haven’t been exposed to anything complicated enough to make scrupulous checking worth the trouble. Therefore it is important for them to see you carry out the checks. In contrast, the APS audience already knows the importance of checking, and assumes you checked the results 17 different ways at home. Therefore they don’t need to see the details. As a related point, the introductory course isn’t just about physics factoids; it’s also about problem-solving techniques. So it’s important for students to see how it works when you make a mistake, catch the mistake, fix the mistake, and proceed from there. True story: I learned some of this by watching Richard Feynman. One day he was going over the midterm in an undergraduate course. In the middle of solving one of the problems, he mentioned that a lot of students had made a certain mistake. He spent some time explaining how to recognize that mistake, and (!) a whole family of similar mistakes, so as to make it easy to stay on the strait-and- narrow path in the future. So, ironically, students got to see him deal with a mistake, not because he was under-prepared, but because he was more prepared than most of them could imagine. He was of course prepared to discuss the right answer, but he was also prepared to say useful things about the wrong answers. He put serious time and effort into it, far more than the minimum required. On the other hand, it would have been even better to teach students how to stay on the strait-and-narrow path before the midterm. Making mistakes is part of the game, but it is better done on homework rather than on the midterm. So there is room for improvement. Again, I am not arguing in favor of being under-prepared. For most teachers, being under-prepared is not an option; they know the material backwards and forwards and they will never be able to unlearn it. The point is, being under-prepared forces you to go slowly ... but the skilled teacher can go slowly without being under-prepared. Being under-prepared forces you to show the intermediate steps, show the checks, and recover from mistakes ... but the skilled teacher does all that without being under-prepared. It’s a bit ironic, but this is one of the ways in which a video is better than a live lecture: the student can pause and/or backspace the video. So being “too slick” is slightly less of a problem on video than it is in person. Different students need different pauses ... different amounts in different places. Books can also be paused. Web documents with lots of hyperlinks are even better. The idea of learning from mistakes applies to students also, not just to teachers. Often they learn more from lessons where they screwed up and then had to deal with the consequences. At the next level, at some point not too near the beginning of the course, students need to learn how to handle ill-posed questions, where there is no answer that fits all the facts, as discussed in reference 2. Such questions abound in the real world. The under-prepared teacher will generate plenty of these by accident, which is not good. The skillful teacher will control the introduction of such questions, after explaining how to deal with them. More than once upon a time, there was a young student who kept getting bad grades on the assignments, because he didn’t show the work. Student: The answers are correct, aren’t they? Teacher: Yes, but you have to show the intermediate steps. Student: There aren’t any intermediate steps. I just figured it out. Teacher: But you have to show the intermediate steps. Teacher: It’s the rules. Don’t blame me; I don’t make the rules. Teachers complain bitterly when students blindly follow some procedure without understanding what they’re doing. However, they shouldn’t be surprised. All too often, the entirely foreseeable effect of the lesson is to encourage conformity and obedience, while discouraging reasoning. Every member of the school board emphasizes that they want to encourage critical reasoning. In our example, the student wasn’t asking for a rule; he was asking for a reason. Show the work. This makes it easier to check the work. Check the work. Although this may slightly increase the workload in the short run, it greatly reduces the workload in the long run, especially when dealing with complex problems. Show the checks. This is particularly helpful in a teamwork situation. In contrast, when the student is given a non-complex non-teamwork situation, it doesn’t make sense to convert this advice into a set of arbitrary and unhelpful rules. Education is supposed to help the student. The teacher’s job is to make sure it really is helpful, and then to make sure the student recognizes it as helpful. Assign the student a more challenging multi-step problem, so that checking the work at each step along the way has value to student – direct, immediate, and perceptible value. Create a teamwork situation, where explaining and documenting the steps has value – direct, immediate, and perceptible value. Explaining the correct conceptions should always come first. Confronting misconceptions can come later, if at all. By way of analogy: If you have a healthy lawn, you won’t have much trouble with weeds. They can’t compete. If the lawn is weak and sparse, due to insufficient water and fertilizer or otherwise, weeds will invade. In an unhealthy lawn, if you just cut off the top of a weed, it will grow back. Even if you manage to kill the weed, it is likely to be replaced by some other weed. See figure 1. Correct ideas need to be linked to each other, and supported by evidence. Misconceptions do not exist in a vacuum; they are supported by their own evidence. If you simply contradict a misconception, it will grow back, sooner or later, probably sooner. Furthermore, often an imperfect notion contains a germ of truth, so if you flatly contradict the whole notion you’re not even correct. On this web site, there are hundreds of documents that try to explain correct ideas. On this site, there is only one part of one document – section 4 – that has focuses on misconceptions, and it should not be the starting point. The literature will tell you that students have more misconceptions than you could possibly imagine ... but if you have any teaching experience at all, you already know that. There are so many misconceptions that it would be impossible to list them all, let alone analyze them. It is OK for teachers to talk amongst themselves about this-or-that misconception, but talking about it in front of students is at least as likely to reinforce the misconception as to dispel it. This brings us back to the main point: To a first approximation, with isolated exceptions, the best policy is to teach the correct concepts and move on. Figure 1 is one way of visualizing the situation. 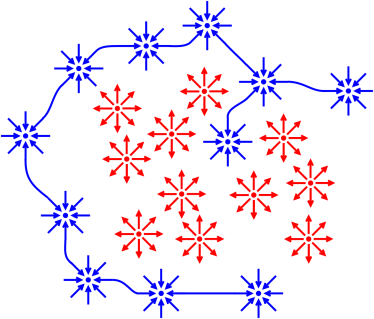 If students move randomly away from any given bad idea (shown in red), they are more likely to settle onto a new bad idea than onto a good idea (shown in blue). You need to attract them to the good idea, not merely push them away from this-or-that bad idea. We now turn to figure 2, which is another way of visualizing the situation. Imagine a very narrow path through a vast swamp. The path is safe, and everywhere else is unsafe. If you pick a random point in the swamp, there is a 99.99999% chance you don’t want to visit that place, or even talk about that place. 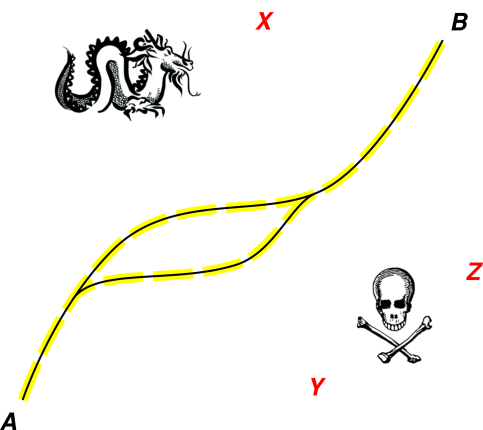 On rare occasions, as you lead students along the path, you might want to point out something nasty that is just next to the path, so they can recognize it and avoid it (as indicated by the yellow places in the diagram). Still, even so, it is usually easier to recognize the path than to recognize the nasties. This is the Anna Karenina principle: All happy students are alike, but every unhappy student is unhappy in his own way. In more detail: Every student who understands the material understands it in more-or-less the same way, but every student who is confused is confused in his own way. In a one-on-one teaching situation, you can sometimes afford to deal with misconceptions as they come up. However, this is tricky and hard to plan, because students often come up with weird misconceptions that you never dreamed of. Meanwhile, in a classroom situation, things are even worse, because each student is going to have a different set of misconceptions. The misconceptions most worth worrying about are the ones that are exceptionally prevalent and exceptionally pernicious. The classic example concerns the washed-out bridge. As discussed in section 3.4, it is well worth confronting misconceptions of this kind. Section 4 contains a list of misconceptions that seem particularly prevalent. Please keep in mind that compiling and/or studying such lists is usually not a good use of resources. I’m not so much worried about the misconceptions that the students bring to class as the misconceptions that the teacher and the textbook author bring to class. These are called didactogenic misconceptions, as discussed in section 3.2. They can cause tremendous difficulties for the students in later courses, and in later life. Remember that it is proverbially difficult to unlearn something. Some textbooks contain large numbers of misconceptions. For an example – not even the worst example – see reference 3. Most of the people who collect lists of misconceptions don’t understand the subject well enough to know what’s a misconception and what’s not. On top of that, even though statistics will tell you what’s common and what’s not, that is nowhere near sufficient; it takes serious judgment to decide what’s important and what’s not. Reading the PER literature is definitely a source of misconceptions. I don’t mean you will get a tidy list of avoidable misconceptions labeled as such; I mean that after reading the literature, if you believe what it says, you will suffer from more misconceptions than you started with. For example, the book by Arons, Teaching Introductory Physics is — unintentionally — an extensive compendium of bad pedagogy and wrong physics. For a detailed review, including a list of some of the misconceptions propagated and/or introduced by this book, see reference 4. A great many misconceptions are created by the way the subject is taught. We call these didactogenic misconceptions. For example, ask yourself which will reach the ground first: a ball thrown downwards or an identical ball thrown horizontally from the same height? According to reference 5, only students who had taken physics got this wrong. Many didactogenic misconceptions are preventable. So, one might naïvely think the solution would be to put a big sign at the back of the classroom where the teacher can see it: DON’T TEACH WRONG STUFF. That would be consistent with the recommendation of wise guys of every era, from Hippocrates to Henny Youngman. A great many are easily preventable, such as the aforementioned misconception about the ball thrown downwards. Some are not so easily preventable. This includes problems caused by ambiguities that are built into the language we use. Some are not preventable, and are just part of the cost of doing business. For example, as discussed in reference 6, it is impossible to teach everything at once, so each idea must be introduced before it is fully explained. This leaves an opening in which misconceptions can grow. We try to minimize this, but we cannot eliminate it. To a highly nontrivial degree, teaching involves managing whatever misconceptions arise ... without entirely preventing them. Sometimes this involves making a mess and then spiraling back to clean up the mess before too much damage has been done. Cleaning up messes is expensive, but a strict no-mess policy would be impossible. Clarification: When I say teaching involves managing misconceptions, that means (with rare exceptions) encouraging correct ideas rather than directly confronting incorrect ideas. As discussed in section 3.1, the maxim should be: “The light shines in the darkness, and the darkness cannot overcome it.” Similarly, another maxim is: “A healthy lawn crowds out weeds.” There is a lot of evidence that talking about a misconception is more likely to reinforce it than to dispel it. In addition, there is the Anna Karenina principle: given 30 students, they will have 75 different misconceptions, and it is simply not possible to directly address them all. To clean up the mess, you do not need to understand every detail of the mess. It includes situations where the teacher or the textbook says stuff that is just plain wrong and easily fixable. There is a lot of this, and we need to fix it, but it is not the whole story. It include situations where everything the teacher says is true in some hyper-technical sense, but you just know it will lead to misconceptions. Obvious examples include when the teacher says “In this situation, the entropy is S = log W.” You just know the students will forget the proviso and overgeneralize the formula. They have an example and no counterexamples, so they have no way of knowing the limits of validity. Rigorously restricting it to this one particular example would make the result useless, so they know that can’t be what the teacher means. Overgeneralizing is sophomoric, but that’s what sophomores do. This idea applies to the definition of “entropy”, the definition of “atom”, the definition of “energy”, and a thousand other things that cannot be understood in terms of a pithy, dictionary-style definition. The only hope is to introduce the idea early on, and then spiral back again and again, refining and enriching the idea. Rationale: A textbook is not an ideal reference book (nor vice versa). The organization is completely different. The spiral approach is appropriate for a textbook but not for a reference book. However, people use their textbooks as references nevertheless. I get really tired of arguing with people who say the entropy «MUST» be equal to log W because it says so right there on page 123 of the textbook. Ditto for the definition of “atom” and “energy” and a thousand other things. If we could make students aware of the more robust discussion on page 456, everybody would be better off. They don’t need to hear the whole story on the first trip around the spiral, but they need to know there is more to the story. Another constructive suggestion, from the keen-grasp-of-the-obvious department: Don’t teach stuff that is completely wrong. Don’t teach lousy approximations when better approximations are easily available. Don’t teach stuff that is 100 years out of date, when the modern stuff is simpler and better. Don’t create big messes for no reason. Cleaning up misconceptions is very expensive. Just because some misconceptions is inevitable does not give you a license to create misconceptions with reckless abandon. There is waaaay too much wrong stuff in textbooks nowadays. When I look through a so-called «modern, research based» textbook from a «Big Name» publisher, I see hundreds of easy-to-fix conceptual errors, without even looking very hard. I’m talking about serious conceptual errors, not counting typos, and not counting multiple occurrences of the same error. At the beginning of the course – and more generally when speaking with people who do not already trust you – it is best to start by talking about things that are true, useful, and non-controversial. Just because something is a misconception does not mean you have to confront it at the first opportunity. There is abundant research that shows that mentioning a misconception is as likely to reinforce it as to dispel it; see reference 7. Indeed, one often observes a backfire effect, as discussed in reference 8: The more you talk about something, even in unfavorable terms, the more likely people are to take it seriously. What’s worse is that if you are speaking to a stranger and confront one of their deeply-held beliefs, not only will they not take your word on it, they will thereafter not take your word on anything else. Remember, most people are not scientists. They do not evaluate ideas by weighing the evidence. They believe things that they hear from people they trust, by people who are on The Team, and if you start out by being confrontational they will classify you as not part of their team. Sometimes bystanders suggest that not confronting misconceptions implies a lack of courage. If you know something is wrong, why not speak up about it? To that I reply: “I have plenty of courage, and I speak up for my convictions in the most effective way I can. I increase my effectiveness by distinguisning the psychological / pedagogical issues from the subject-matter issues. Once I have dealt with the former I will be in a stronger position to deal with the latter. Sometimes an idea is just completely wrong. Such ideas are relatively easy to deal with. However, in many cases, you are dealing with a notion that contains a germ of truth. It is important to recognize this. The most dangerous ideas are the ones that are usually mostly true, but then betray you at some critical moment. One classic example of a misconception that is “almost” true concerns a washed-out bridge. Most people take it for granted that it is OK to drive across the bridge, and this is usually true, i.e. usually not a misconception at all. However, if the bridge has been washed out this becomes a misconception, and could have fatal consequences. Therefore it is worth putting up some “Bridge Out” signs and barriers, and possibly even some flashing lights. As always, it is better to make constructive suggestions, as opposed to merely pointing out a problem. In this case, it would be silly to put up a “Bridge Out” sign just at the edge of the washout, because by the time drivers could see the sign it would be too late to do anything about it. Instead the proper procedure is to go back to the previous intersection and block off the approaches to the bridge. This includes putting up constructive signs suggesting alternate routes. Sometimes the misconception is the result of an ambiguity, as discussed in section 3.5. That is to say, sometimes a statement is entirely true if you interpret it one way, but false if you interpret it another way. In this case it is necessary to deal with both interpretations. You can’t just close your eyes and pretend the other interpretation does not exist. The fundamental mistake – the fundamental misconception – is not recognizing the ambiguity. Sometimes you have to confront a misconception because of the safety implications. One example is the washed-out bridge. Similarly, in the research lab you might have high-power invisible lasers, high voltages, toxic chemicals, and other things that present non-obvious hazards. In contrast, if there are no ambiguities and no safety issues, then you have the option of confronting the misconception or simply ignoring it. Often ignoring it is the best option. There is lots of evidence that mentioning a misconception is at least as likely to reinforce it as to dispel it. As an example of a classroom misconception that might be worth confronting, consider the first law of motion. Practically everybody starts out with the Aristotelian notion that objects at rest tend to remain at rest, and objects in motion tend to come to rest. This directly conflicts with the Newtonian principle that objects in motion tend to remain in motion. As is so often the case, we are dealing with a notion that contains a germ of truth: In situations where friction is overwhelmingly important and taken for granted, objects do tend to come to rest. That’s fine. It is OK for students to retain that idea, provided they learn to distinguish it from situations where friction is not so important. In physics we start by considering situations where friction is completely negligible. Later we consider cases where there is a moderate amount of friction, but even then we do not take friction for granted, but instead account for it as one of the forces that change the state of motion. First, explaining the new concept and supporting it with reasonable amounts of evidence. Secondly, contrasting the new concept with the old concept. Only then does it make sense to explain what part of the old concept is considered a misconception. It must be emphasized that it is pointless (or worse) to contradict the old idea before the new idea has been presented. It is not helpful to push students away from a bad idea unless/until they have a good idea to latch onto. The same principle applies to everyone you deal with, not just students. It applies at every age, from infancy on up. For example, if a young child is banging a Wedgwood teacup against the tile floor, it is better to give the kid something else to play with, rather than simply taking the teacup away. A small plastic bottle with a few dried beans inside makes a much better toy, from everyone’s point of view. It is quite common to find several different, incompatible ideas masquerading behind the same name. This is a perennial source of difficulty. In a non-technical context, «force» refers to some sort of causation, as in “the bandit forced the lady to hand over her purse.” In physics, force has nothing to do with causation; force does not cause acceleration, nor does acceleration cause force. There is absolutely no equal-and-opposite «force». For every force there is an equal-and-opposite force. dp/dt is the only meaning of the word “force”. There is a notion of scalar acceleration, namely the rate-of-change of the scalar speed. It is the opposite of deceleration. There is also a notion of vector acceleration, namely the rate-of-change of the vector velocity. There is no corresponding notion of vector deceleration, only acceleration in the opposite direction. Introductory physics texts like to pretend that scalar acceleration is crazy wrong, but in fact physicists use the concept all the time. People (including physicists) use both concepts all the time, and there would be nothing wrong with that, except for the fact that they use the same term for both. In physics, there are two different technical meanings of the word “gravity”. There is the framative gravity g@F (in some frame F). It is 100% frame-dependent. There is also the massogenic contribution δgM. See reference 9. It is 100% frame-independent. I do not recall ever seeing a textbook make this distinction; the usual practice is to use the name “gravity” for both, use the symbol g for both, and then write contradictory equations involving g.
Suppose you are a flagellate bacterium. You live in a world with a verrrry low Reynolds number. Friction is dominant, and inertia is an utterly negligible correction. Suppose you are an aircraft. Your Reynolds number is much higher. Inertia is dominant, and friction is a relatively minor correction term. In the introductory physics class, we choose to start by considering the low-friction case. Students’ intuition about the high-friction case is not wrong; it’s just incompatible with our chosen starting point. A direct attack on the idea that objects in motion tend to come to rest will never be successful, because the idea has too much supporting evidence. The best you can hope for is to place limits on the validity of the idea, to restrict it to tiny objects moving slowly through a sticky medium. The same attitude works for notions of “heat content” aka “caloric”. Such ideas are not crazy wrong, and indeed it is easy to find supporting data. However, such ideas apply only cramped thermodynamics, i.e. to situations so heavily restricted that it is impossible to build any kind of heat engine. When applied out of context, such ideas greatly interfere with any attempt to understand uncramped thermodynamics. In thermodynamics, there are two different definitions of “adiabatic” in common use. My recommendation is to avoid the word, and use other terms instead, such as “thermally insulated” or “gradual and isentropic (as opposed to sudden)”. In thermodynamics, there are at least four different technical definitions of “heat” in common use (not to mention innumerable nontechnical and metaphorical meanings). I recommend bypassing this whole mess and instead formulating the subject in terms of energy and entropy ... without mentioning “heat” at all. When teaching about bisconceptions, emphasize that context matters. The meaning of a word in one context is different from the meaning in another context. Neither meaning is wrong; they’re just different. The only real misconception, i.e. the only mistake, lies in not recognizing the distinction, or not being clear about the context. Often the first step is to clarify the terminology. Sometimes it suffices to tack on some adjectives, as we saw in the example of “scalar acceration” versus “vector acceleration”. Sometimes you have to coin a new term, as we saw in the example of “framative gravity” versus “massogenic gravity” – and in the example of “bisconception” itself. In contrast, I do not recommend choosing one possible meaning and then waging war against everybody who uses the other meanings. Statement (A) is entirely correct, whereas statement (B) is entirely incorrect. Many ideas that are a good approximation in one context are a bad approximation in other contexts. The goal is to formulate a more-specific version of the idea, containing enough provisos so that you know which is which. While some misconceptions are only lightly held, others are quite deeply held, based on the student’s lifetime of experience (in school and otherwise). As mentioned in section 3.3, reference 7, and reference 8, when you confront a deeply-held misconception, students may become wary, defensive, or even angry. It is likely that the students will pretend to discard the misconception, but then re-adopt it at the first opportunity. What’s worse, sometimes direct confrontation can backfire, causing the student to cling to the misconception even more tightly, and to discredit the teacher in the process. There is a grain of truth in most misconceptions, especially the most pernicious ones. Therefore you should start by considering the possibility that you are facing a bisconception. That means there is actually some good evidence supporting the so-called wrong idea. It’s not entirely wrong; it’s correct in one context but wrong in another. The only real mistake is in not recognizing the ambiguity and not being clear about the context. In such a case, it may be possible to disambiguate the terminology by adding adjectives, or it may be easier to switch to completely different terminology for one or more of the affected concepts. See section 3.5. It is generally not possible to eradicate the old idea – and not even worth the attempt – even if the idea is completely unhelpful in the situations you want to address. Instead you have to build something new alongside it, as in figure 4 and figure 5. This requires a delicate tight-rope act. You have to be respectful of the old idea, even as you are trying to shift attention to the new ideas. Sometimes it helps to use a two-column format, as in section 3.5, or other techniques to highlight the contrasts. It may be that the correct conception is not sufficiently supported. In such a case, it is best to focus on the correct conception, tying it to additional data and additional reasoning. Especially in the introductory course, start by delineating the good things by talking about what they are, not about what the aren’t. Give them something positive to move toward, as in figure 1. Sometimes you can delineate something using the idea of negative space, as in figure 3, but that’s usually not the first choice. It may be that the misconception is supported by a great deal of bogus data and fallacious reasoning. In such a case, rather than directly attacking the symptom, it may be helpful to go upstream a step or two, and attack the bogus data rather than whatever misconceived conclusions might derive from it. That is, figure out what sort of mistaken evidence is supporting the misconception, and then demonstrate why that evidence is invalid. Hands-on, live demonstrations play an important role here. Without mentioning the misconception itself, you can gradually undermine its supports, one by one. It may be a case of insufficient specificity, as discussed in section 3.6. In such a case, you need to explain why the notion is correct in some contexts but not in others, and explain how to tell the difference. A change in terminology might help (but might not be sufficient by itself). There is a pedagogical / psychological dimension to this. There is a mountain of evidence suggesting that established ideas are virtually never truly unlearned, not on any pedagogically relevant timescale anyway. Instead the best you can hope for is to hide the bad ideas behind a wall of better ideas, so that in any given context the right idea is more likely to be recalled. The wrong (or merely inapplicable!) ideas are still there; they just won’t be the first things that come to mind. So, rather than figure 1, the picture is more like figure 4. By telling students their ideas are not crazy wrong – just restricted – they are less likely to get defensive. It enhances the teacher’s credibility. It gives students a framework that accounts for all the data. This upholds one of the core principles of critical reasoning: account for all the data. Figure 5 shows an even better version of the idea of adding a layer. If we choose an idea at random from a sack of acceleration-related ideas, we will be wrong more than half the time, as shown on the left side of the diagram. Old ideas never really go away, but we can add a traffic-cop layer that steers our thoughts in the right direction, depending on context, as shown on the right. Ideas that were mostly wrong before are now reliably correct, in context. This is consistent with a recurring theme, namely that what matters is not how many factoids you know, but rather how well you can recall them when needed. This was mentioned in item 8 in section 1. There is no clear distinction between thought and memory, because recall itself is a thought process. Some people use the word “misconception” in very narrow ways, or avoid it altogether. One teacher sent me a list of thirty different terms intended to describe different types of misconceptions, preconceptions, and related ideas. With rare exceptions, I am not interested in such fine distinctions, because the methods of dealing with them are the same for all. I use words like “idea” and “notion” in a broad sense, including ideas that are completely correct, completely incorrect, and everything in between. Almost all ideas are imperfect in some way. I use the term “misconception” to apply to whatever part of the idea is incorrect. I make an exception for the term bisconception, which I use to make the point that many things are commonly called misconceptions aren’t entirely wrong; they’re just out of context. Another compendium of misconceptions can be found in reference 10. Some related issues of weird terminology are discussed in reference 11. Keep in mind that you should always start by emphasizing correct conceptions, as discussed in section 3.1. To say the same thing the other way: creating and/or studying lists of misconceptions is usually not a good idea, and should never be a starting point. Far and away the biggest problem is an overall lack of critical thinking skills. See reference 12. This includes, far too often, accepting a “rule” without differentiating between a “rule of thumb” and a “rule in all generality”. This includes learning a “rule” without reconciling it with other experimental and theoretical things they know. This includes learning the headline of a rule without learning the provisos, without learning the limitations on the range of validity of the rule. Design the work from the outset to be readily checkable. Chronic and pervasive inability to tell the difference between a good approximation and a bad approximation ... and indeed unawareness that this is even an issue. See reference 13. Multiple misconceptions about scientific methods. For example, fixating during the planning stage on a single hypothesis. Common sense and basic scientific principles demand considering all the plausible hypotheses. Indeed this is required for safety if nothing else. See reference 13. The false notion that scientists change “only one variable at a time”. Multiple misconceptions about “significant figures” and/or how to handle uncertainties. See reference 14. See also item 8. It is easy to find examples of professors being completely confident about the wrong answer. That includes pervasive misunderstanding of what “error” means in the context of “error analysis”. See reference 14. Widespread misconceptions about the fundamental principles of quantum mechanics. The fact is that even in fully quantum mechanical systems, not everything is quantized, not all waves are quantized, not all states are discrete, et cetera. See reference 15. Innumerable misconceptions and/or archaic conceptions about special relativity. This includes velocity-dependent mass, rulers that can’t be trusted, clocks that can’t be trusted, et cetera. It is a misconception to think those are a good idea (even if they are not provably wrong). Certainly they must be unlearned as a prerequisite to any modern (post-1908) understanding of special relativity, spacetime geometry, and 4-vectors ... not to mention general relativity. See reference 16. Misunderstanding of the famous equation E=mc2. Hint: this E is the rest energy. If the mass is moving, we need a more complicated formula. Mass is the invariant norm of the [energy, momentum] 4-vector. See reference 16. Misunderstanding of general relativity, especially as to what is curved, and in what direction it is curved. A marble rolling around inside a bowl does not illustrate general relativity. See reference 17. Misconceptions about what expands and what doesn’t – and why it doesn’t – during the expansion of the universe. See reference 18. The idea that «Kirchoff’s laws are fundamental, and/or can be directly derived from Maxwell’s equations». A previous version of the wikipedia article said exactly that (before I changed it). In fact, for AC circuits, both of Kirchhoff’s laws are flatly contradicted by the Maxwell equations. Both of Kirchhoff’s laws are routinely violated in practice. See reference 19. There are tremendous misconceptions about this. Assuming that every voltage must be a potential, and every electric field must be the gradient of some potential. This assumption is embodied in Kirchhoff’s laws. We know it can’t be true when there are time-varying magnetic fields running around. Misconception that thermal energy (whatever that means) is random kinetic energy to the exclusion of potential energy. See also item 22. For details, see reference 20. There are some who try to define energy as “capacity to do work”. This formulation is fairly common in nonscientific books. It appeals to those who know nothing about thermodynamics. See reference 20. Entropy as “spreading of energy”. Misconception that expansion of the universe correlates with thermodynamic irreversibility i.e. entropy production. Innumerable other misconceptions regarding entropy. See reference 20. Trying to think of thermodynamics in terms of a “heat content” or “thermal energy” state function. See reference 20. Writing d(something) for ungrady one-forms, e.g. dQ = T dS. (This is somewhat related to item 22.) See reference 21. Terminology and thought patterns that confuse “heat” with “enthalpy”, e.g. tables of the “heat of reaction”. Counterexample: reversible reactions such as electrochemical cells. Similarly, misconception that heat is conserved (e.g. in the typical statement of Hess’s law). See reference 20. Holy wars about the various definitions of “heat”. Example: adding heat to something “surely” raises its temperature. See reference 20. Conflict over whether the rate constant for the reaction x A → y B + z C should depend on the stoichiometric coefficient x. In particular, deciding to scale the rate constant by a factor of x without regard to the order of the reaction. I claim that for an Mth order reaction, the normalization factor is x(M−1). I claim you want to define the rate constant per unit of “→” not per unit of [A]. Misconception that electrons must “jump” from stationary state to stationary state. To say the same thing in NMR terminology, the misconception is that π/2 or π/10 tipping pulses are impossible. Misconception that electrons “like” to pair up, like Siegfried and Roy. In fact, physics says they hate each other. Spectroscopy (as summarized by Hund’s rule) says that in the ground state, they pair up only as a last resort. Misconception that breaking a chemical bond releases energy, the way that breaking an eggshell releases what’s inside. Misconception that pure water necessarily has pH 7 or that pH 7 corresponds to neutral conditions, i.e. neither acidic nor alkaline. In fact, pure water at 100 ∘C has a pH of 6.13 or thereabouts. Misconception that during changes of state the temperature remains constant. Multiple inconsistent definitions of “molecule”. – molecules = “stable particles of matter” is a non-starter, because water molecules are not stable in aqueous solution. – molecules are “covalently bonded” is a non-starter, because many things that ought to be considered molecules are not covalently bonded. – molecules obey the “law of definite proportions” is a non-starter, because many macromolecules do not uphold it. Uncertainty about the definition of “compound”. Related minor point: There seem to be widespread misconceptions about the definition of “dimer”. Also note that the IUPAC definition of polymer is very broad, and does not parallel the definition of dimer. The alleged dichotomy between “ionic compounds” and “molecular compounds”. The whole notion of “physical change” as distinct from “chemical change” is disconnected from reality. There are multiple inconsistent definitions of the terms. All the usual definitions conflict with the usual examples. See reference 22 . In most chemistry texts, there is some kind of a flowchart that uses various crude criteria to classify substances as elements, compounds or mixtures. This incorrectly implies that it is impossible for any substance to simultaneously be an element and a mixture. In particular, it gets you into trouble with an element that is a mixture of isotopes. The right way to think about this is in terms of equivalence classes. Things that are “pure” w.r.t one property may not be “pure” w.r.t to another. Misconception that “Like Dissolves Like”. Le Châtelier’s «principle» is highly problematic. Le Châtelier in his lifetime gave two inconsistent statements of the «principle». One is trivially tautological, and the other is false. See reference 23. Widespread deep-seated misconceptions about osmosis and osmotic pressure. This includes using glycerin or other hygroscopic substances as pedagogical examples of osmosis. See reference 24. Way too much emphasis on the Bohr model of the atom, i.e. electrons following Keplerian orbits within atoms. There are profound problems with Lewis dot diagrams in general, and the idea of filled Lewis octets in molecules in particular. These ideas are are fundamentally inconsistent with all the spectroscopic data ... and other data. The paramagnetism of O2 makes for a nice, graphic, in-class demonstration. See reference 25. 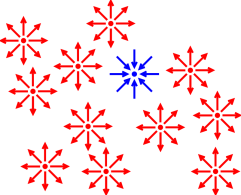 It’s particularly comical when they arrange Lewis dots (falsely representing electrons) onto little Keplerian circles (falsely representing orbitals) to make molecules (falsely suggesting that there are filled “Lewis octets” in molecules). Uncertainty about “orbitals”. Does the term refer to wavefunctions describing actual electrons, or does it refer to basis wavefunctions that are purely mathematical? The whole idea of oxidation numbers in redox reactions is grossly abused. When balancing redox reactions, it is simpler and better to just use conservation of charge, directly. See reference 26. Arons asserts there are two kinds of electrical charge. He says the two-fluid model is right, and the one-component model is wrong. See reference 27 for a refutation. Arons also suggests teaching students the difference between “passive forces” and “active forces”. Questions about where the lanthanoids and actinoids belong in the periodic table. There should not be any questions. These are basically elementary fencepost errors. See reference 28. Also, a related bundle of misconceptions revolve around the ill-conceived notion of p-block, d-block, and f-block elements ... and the corresponding “block structured” periodic table. See reference 28. Numerous misconceptions concerning absolute zero, degeneracy, zero-point motion, et cetera. Any variable that is mentioned is important. Any that is not mentioned must be constant and/or irrelevant. That is to say, the words “Other Things Being Equal” (OTBE) are implicitly part of every question. An example involves teaching Boyle’s law, Charles’s law, Avogadro’s law, and Gay-Lussac’s law separately, on the theory that in each case “the” variables not mentioned are held constant. This is a notorious OTBE fallacy. For example, T1/P1=T2/P2 is not valid if we hold N and S constant. See reference 24. The H2O molecule has a “bent” shape, more-or-less U-shaped. The stick-figure that approximately represents the bonds between nuclei is V-shaped, and the electron-density is U-shaped. See e.g. reference 29. The electron density in water does not exhibit tetrahedral geometry, tetrahedral symmetry, or tetrahedral shape. Fussing with the terminology will not change these facts. See reference 29. Attempts to build a classical ball-and-stick model of the isolated ammonia molecule. Confusion regarding negative temperature coefficient versus negative activation energy. These are not the same. Persistent failure to understand (even after being told) that dimensional analysis can sometimes give the wrong answer, both false positives and false negatives. That is, arrested development at the level of dimensional analysis when a scaling analysis is called for. See reference 31 and reference 32. Teaching the “density triangle” as described at e.g. reference 33. This approach has many weaknesses, but we should not overreact. You can solve the problem by converting this to an equation M/(D V) = 1 and then forgetting the triangle. If you don’t convert, and stick with the “cover up” rule, it is not just opaque to the underlying math, it is actively misleading. The problem becomes obvious if/when the underlying equation has more than one variable in the numerator. The triangle is a crutch. Normal students should not need any such crutch. Allegedly, the term “algorithmic” is synonymous with rote, i.e. turning the crank without thinking. This is crazy wrong. Algorithms are good for you. Do not confuse the presence of one thing with the absence of another. I once heard a professor talking about a «adiabatic calorimeter .... “Adiabatic” means no heat.» In other words, we’re talking about a no-heat heat-capacity experiment. This is what comes from restricting the definition of “heat” (“flow across a boundary”) without checking the consequences for consistency. True or False? – There is no such thing as centrifugal force. See reference 34. True or False? – As part of the recovery from a severe spiral dive, it is important to roll the wings level and then pull back on the yoke. Hint: John-John Kennedy probably didn’t know the right answer to this one. True or False? – The airplane’s stability depends on the fact that the tail is producing a downward force. True or False? – In a Cessna 172, starting from normal flight, if you increase the throttle setting (without moving any of the other controls) the airplane will speed up. True or False? – If two parcels of air flow past a wing, they move from the front to the back in essentially equal amounts of time, even if one passes above and the other passes below the wing. True or False? – To work properly, an airplane wing must be curved on top and relatively flat on the bottom. True or False? – Blowing a jet of air across the top of a piece of paper is a good way to demonstrate the principle that “faster-moving air has lower pressure”. True or False? – Bernoulli’s principle is only valid for incompressible fluids, which means it cannot be trusted for something as obviously compressible as air. True or False? – Bernoulli’s principle is essentially a corollary or application of the principle of conservation of energy. True or False? – As suggested by the saying “power plus attitude equals performance”, if you put the airplane into a particular attitude with a particular power setting, the airplane will give you the corresponding performance (airspeed, rate of climb, et cetera) and if you maintain this attitude and power setting you will continue to get that performance. True or False? – To perform an ordinary steady roll to the right, the upgoing wing must produce a greater amount of lift (compared to the other wing), and therefore a greater amount of drag, which is why you need to apply steady right rudder during the roll. True or False? – During flight at very low airspeeds, some sections of the wing are unstalled, while other sections are stalled and contributing practically nothing to the lift. True or False? – During a normal steady climb, lift is necessarily greater than weight. True or False? – During a steady, coordinated turn to the left, dihedral creates a tendency for the airplane to roll back toward level, and you generally need to apply steady left aileron to overcome this. True or False? – P-factor (i.e. asymmetric disk loading) explains why, early in the takeoff roll in a Cessna 172, you must apply right rudder to keep it going straight. True or False? – On approach, you should never retract the flaps to correct for undershooting, since that will suddenly decrease the lift and cause the airplane to sink even more rapidly. True or False? – When properly performing turns on a pylon in the presence of wind, the airplane will remain at the pivotal altitude, and the pattern will be shifted somewhat downwind relative to where it would be in no-wind conditions. True or False? – To model the earth’s magnetic field, take a globe and skewer it with an ordinary bar magnet, putting the bar’s “N” pole in northern Canada, and its “S” pole in Antarctica. I emphasize that the foregoing list is restricted to misconceptions that afflict professionals in the field. There is of course a far wider class of misconceptions that afflict naïve students. I have seen collections of student misconceptions, but they all seem so incomplete as to be virtually useless. Furthermore some of them tend to replace old misconceptions with new ones; see e.g. reference 4. A great many misconceptions are being spread by the NGSS, as discussed in reference 35. Talks to Teachers On Psychology; and to Students on Some of Life’s Ideals (1899). Chapter XII deals specifically with memory. As the name suggests, geometry was initially the science of surveying the surface of the earth. However, the formula a2+b2=c2 does not reliably apply to the surface of the earth, because the surface is curved, not planar. If you carefully survey a moderately large triangle, you will notice the curvature. Indeed, if you make the triangle large enough, you can construct on the surface of a sphere a triangle with three right angles.